I suppose it comes from being adopted, though I was raised with my amazing adoptive parents since I was 10 days old, I’ve always felt like travel fulfilled my fascination as to where my biologically ties originated. People like me who have chosen not to pursue the identity of their biological parents can’t go to ancestry.com and plug in a name. We don’t know any names. So for me, I feel a sense of identity through strong emotional feelings, or bonds that I have associated with places around the world. My daughter Tyler and I went to Peru to visit Machu Picchu in 2012 and it was one of the most fantastic trips I’ve ever taken, but I’m pretty sure I am not descended from the ancient Incas. If I did believe in Reincarnation, I might have been murdered during the Russian Revolution. As a child, I had many frightening dreams to that effect as well as a strong obsession with anything Faberge or Romanoff. And at the age of 10, I was pretty sure I had to be a long lost Von Trapp child. That might explain two different trips to Austria both of which culminating at the epicenter of all things Von Trapp – Salzburg. Interestingly, people call Quarry Hill the Sound of Music House and some day I would love to rent a huge projector and invite all of our friends over to watch the Sound of Music sing – a- long! Bottom line, Quarry Hill and the Hetzers came together through a strong magnetic pull and every time I drive up up the driveway and view this magnificent history-rich house in front of me I feel in a way I am coming home. So you might gather that I love Europe! I went for the first time for our honeymoon in 1984. My husband had just finished graduate business school and we had a month before we started work. Early on we decided to buy a Volvo sedan and pick it up at the factory in Goteborg, Sweden. If you don’t think the world has changed much in the past 30 years think back to travel in the 80’s. Pre-euros, no internet, no cell phones, stopping at every boarder to show passports, no google maps, Checkpoint Charlie was still checking and the Berlin Wall was standing tall. The list goes on and on. Can you believe how easy it is today! Google and go! With Easter approaching I think the first trip I would like to travel blog for you would be a trip I took in April 2014 with my daughter Katherine. She had a month before she was entering nursing school and that European bug was biting bad! Before I start I want to give a shout out to Airbanb. We rented wonderful apartments, in great locations that were far more reasonable and comfortable than pricey hotels. Check them out! I had long wanted to visit counties once behind the Iron Curtain and allow myself to experiences locations in Europe I grew up thinking were scary. I knew I wanted to go to Poland. My friends think I am strangely attracted to WWII literature, movies and documentaries regarding the Holocaust. I admit that I am emotionally drawn to that period of history more than any other time. To my knowledge I am not Jewish but again, I don’t know! With some research and recommendaions from our daughter’s in-laws we settled on Krakow combined with a first stop in Prague culminating in Vienna. I add this next portion because I know everyone can identify with this proven fact! The more you anticipate, the more likely there will be a snag. 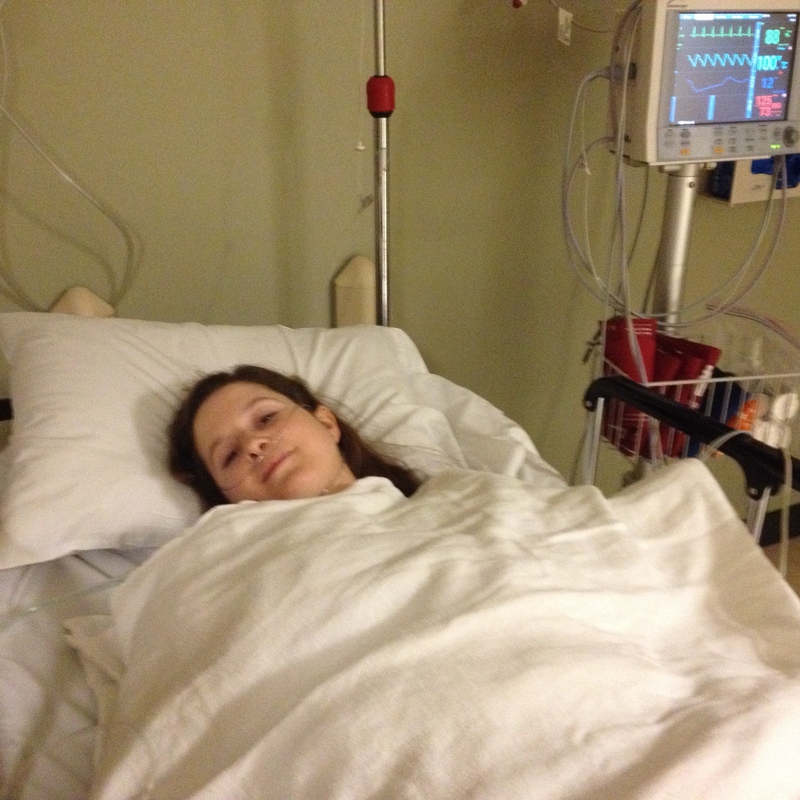 Ten weeks before lift off, Katherine destroyed her knee skiing in Keystone, Colorado. Complete tears of her ACL, MCL and a patella tear as well. BIG SNAG. We got her back to Richmond for surgery and for the next ten weeks it was nothing but PT, a manipulation, and running up and down the stairs a zillion times a day for me. I will say we caught up on our Grey’s Anatomy! There is nothing like a trip to Europe to inspire and Katherine worked her fanny off! In terms of travel I suggest you play the lottery – win big- put the majority in a foundation to give away, but save enough to be a part of something like NetJets. Since most of us never travel that way or win the lottery, my personal requirement, if possible is a non-stop flight. If you don’t live in a large metropolitan region, the biggest problems come when trying to get from a smaller regional airport to the big hubs. Richmond has no international flights to Europe so we always go to Dulles or Reagan in the DC area. Most flights leave in the late afternoon to evening and arrive back to DC around 2 pm with plenty of time to beat the traffic home. Katherine and some friends had already started their trip the week before with stops in Rome and Nice. I just prayed she took no tumbles and kept up her exercises. I was to meet her in Prague March 30. Flying that far alone can get lonely, even when you are excited. If you are so inclined, a chip of an ambien works wonders. Have it with dinner and if you are lucky the next thing you will hear is “ladies and gentlemen we are preparing for our decent into Frankfort” all refreshed and ready to go. 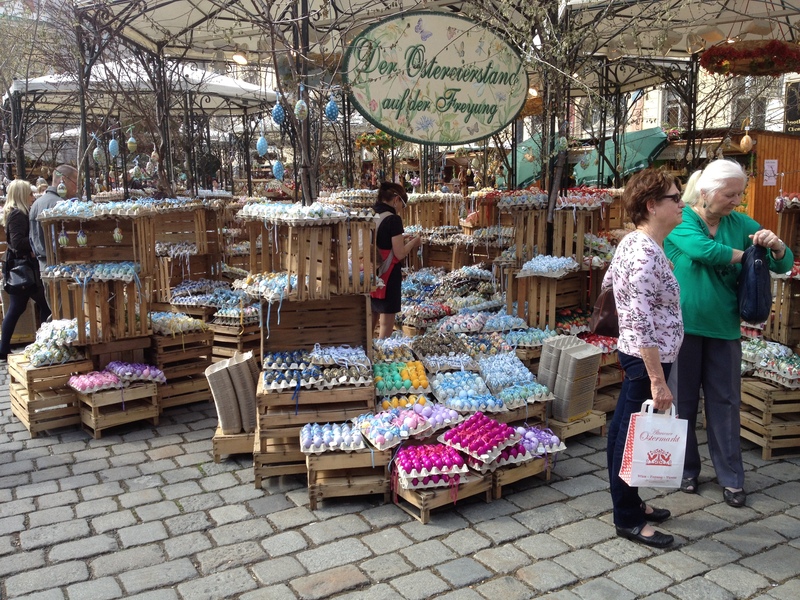 It is hard to untangle the sequence of these three adventures but I am going to take Vienna first because I know you will enjoy the Easter photographs and I don’t want to overwhelm you with all three adventures in my first posting. I admit I would never spend the required time to enjoy them all at one sitting. So here goes!!! Onward to Vienna via Krakow on 1960’s Czech Transport train arriving 6:30 am. A far better experience than the Prague -Krakow train. (That story is coming and will be detailed in my next posting.) This time I slept well but Katherine was a zombie. This was our only day of uncertainty. We had rented another airbanb flat but couldn’t get into it until the afternoon so we were basically on the street from 7 am until later in the afternoon. We were dropped by taxi at our flat’s manager’s apartment and had our breakfast in a cafe across the street. Katherine snoozed head down on a table and I pretended to read a German newspaper until 9:00 am -the time we had arranged to drop our luggage at her apartment for safe keeping. All went well but she had a very” inconvenienced” mother griping in German in the background just adding to the confusion. I tell you these inconviences as a reminder that nothing ever goes as smoothly as you might imagine! This kind of travel requires patience and you have to be flexible and roll with the punches. With our bags safely (I hoped) in the possession of the Austrian sourpuss, we took our next leap of faith for the day. The address for our Viator.com bus trip was within walking distance of her street but we had little confidence we were on the right track. We arrived at the boarding destination a bit early to find no other travelers waiting, and no representatives to answer our questions. I truly thought the day was a bust. However, in time the people and busses did come! The day trip we booked was to tour the Wachau Valley. This day trip was high on our list because of the towns it passed through -Melk and its Benedictine Abbey as well as Krems- while following along the scenic Danube River. Unfortunately we missed the opportunity for the boat portion of the trip by just a few of days as it had not started up for the season. So it was the bus the whole time. The more you read my blogs the more you will learn how I feel about bus tours!!! I don’t think I can recommend this tour operator for many reasons though we did see everything that had been promised. The problem is exploring can not be limited to 30 minutes here and 30 minutes there. Again, I would do your research and look for a small group tour with a guide who speaks JUST your language. No one needs to hear descriptions four additional times in a languages you don’t understand. Krems is adorable but we only got a snapshot of its beautiful tree lined lanes and pristine “pedestrian only” Old Town. This is it! The only picture I was able got get while crawling over our fellow bus mates. UGH!!! To further bolster my distaste for bus tours, I have no idea how these operators negotiate with shops and restaurants, but you are delivered on a silver platter to them with virtually little opportunity to go elsewhere. Though our day was fine, I KNOW we could have done better. I will be happy to research the perfect day trip and take you back! 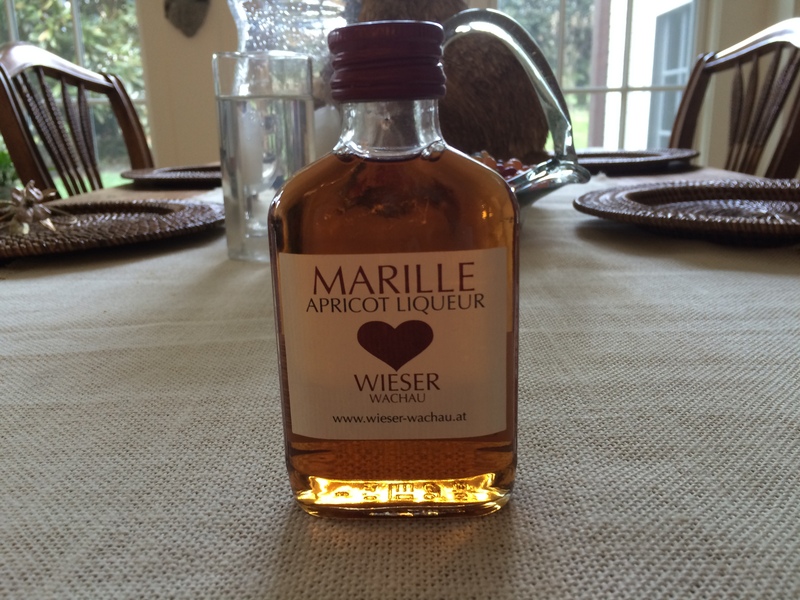 Still unopened and sitting in our bar is this small bottle of Marille Apricot Liqueur, purchased somewhat under pressure at the only gift shop we were allowed to peruse. 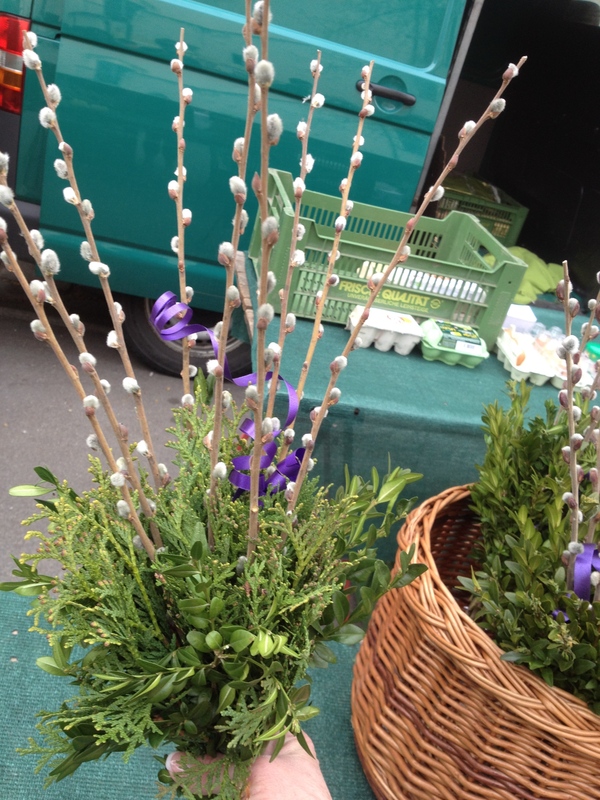 While our whirlwind 30 minutes in Krems was by no means enough, we did pass magnificent and original Easter arrangements for sale everywhere. This is just a tempting taste with so much more to come once I take you through the streets of Vienna !! The following morning, post bus tour, we started observing one of our biggest giggles. 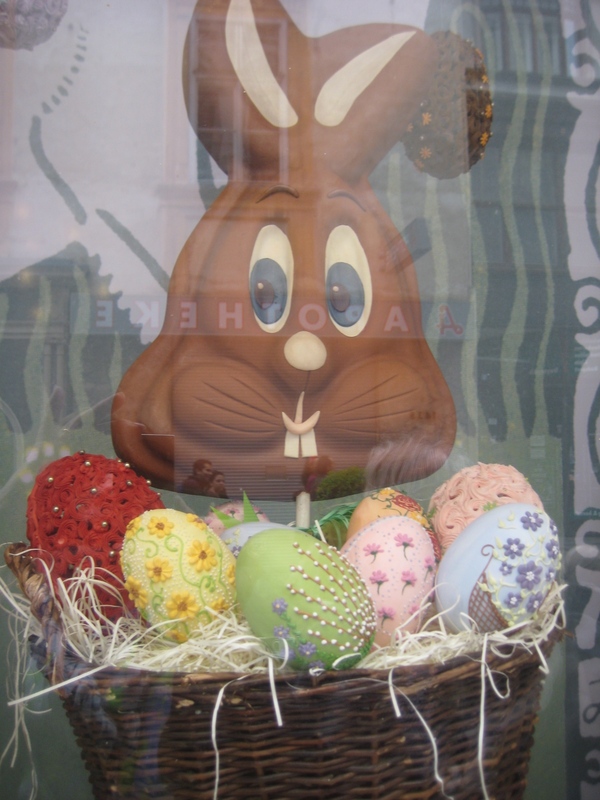 Every corner in Vienna has a fabulous will-power tempting pastry, candy, and ice cream shop. In the the United States we have the daily barrage of news stories on obesity and the perils of fast food. 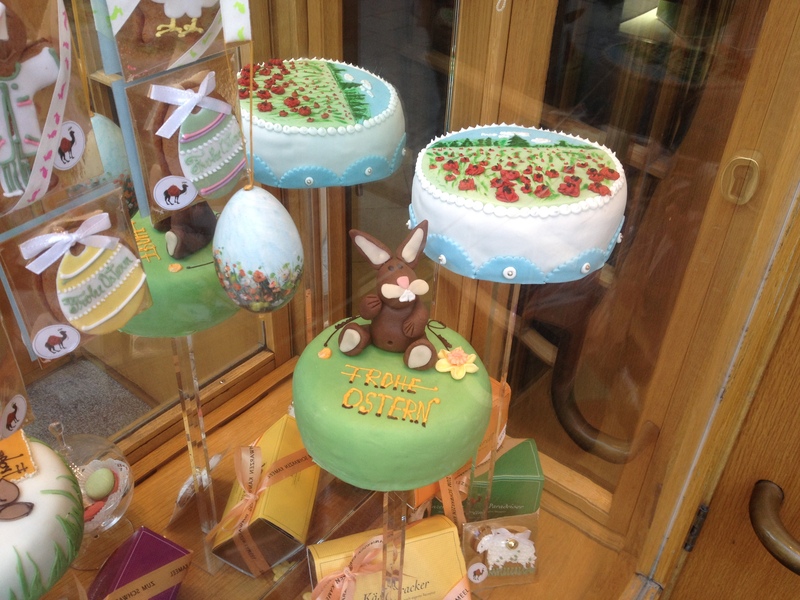 The Austrians seem to not have a care in the world about the consumption of their sweets. By 9 am we saw people slurping their way through giant ice-cream Sundays, eating behemoth portions of pastries and cakes all being chased by rich dense coffees. I would not call them skinny but they look nothing like the our televised headless overweight pedestrians walking down the streets of the US. Katherine and I were mystified!! Vienna is one of those cities that shuts down on Sundays; food, drink and museums are the only open options. If you need sundries you better buy them Saturday! I’m not kidding! Because of this we decided to take the pubic transportation out to Schonbrunn Palace which was a former Imperial summer residence. 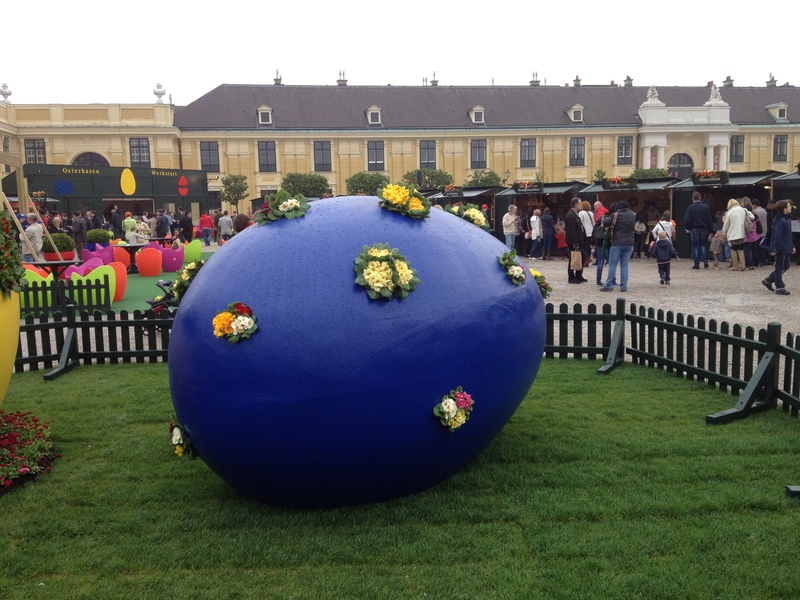 Despite a bit of morning drizzle an Easter Festival on the surrounding grounds of the Palace was in full swing. 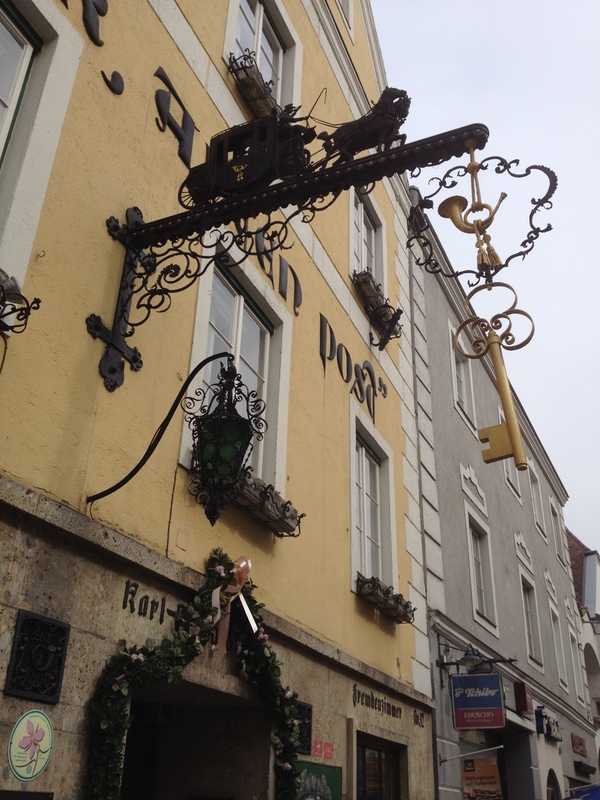 Side bar here… Mom and I took the girls on the “Heidi Tour” when they were 10 and 12. The highlight of our trip was our stay in Salzburg and I am going to blog that trip later as well. 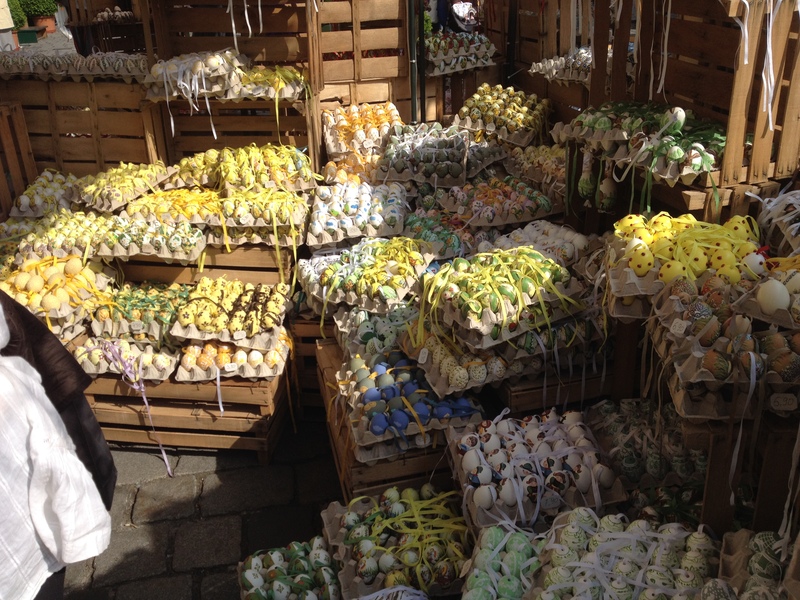 It was in Salzburg that I absolutely fell in love with the Easter egg vendors. 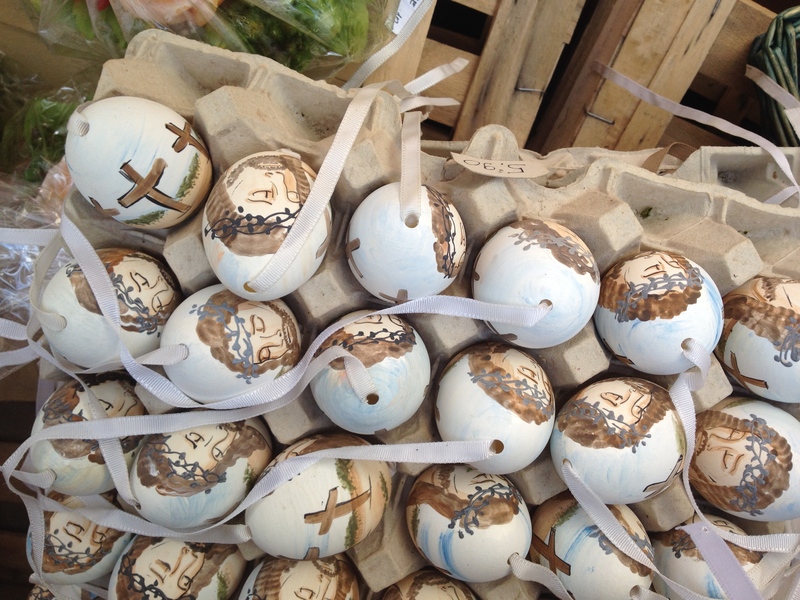 We had never seen anything like the stores selling divine intricately painted blown eggs. I couldn’t resist them then and I couldn’t resist them now. 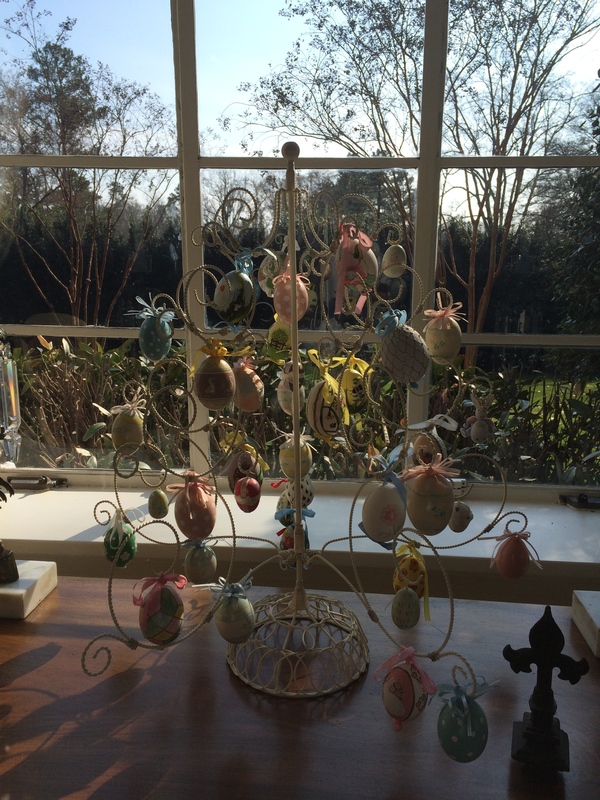 These are the eggs I collected in Salzburg 16 years ago hanging on my Easter egg tree! Now back to the palace and the Festival. 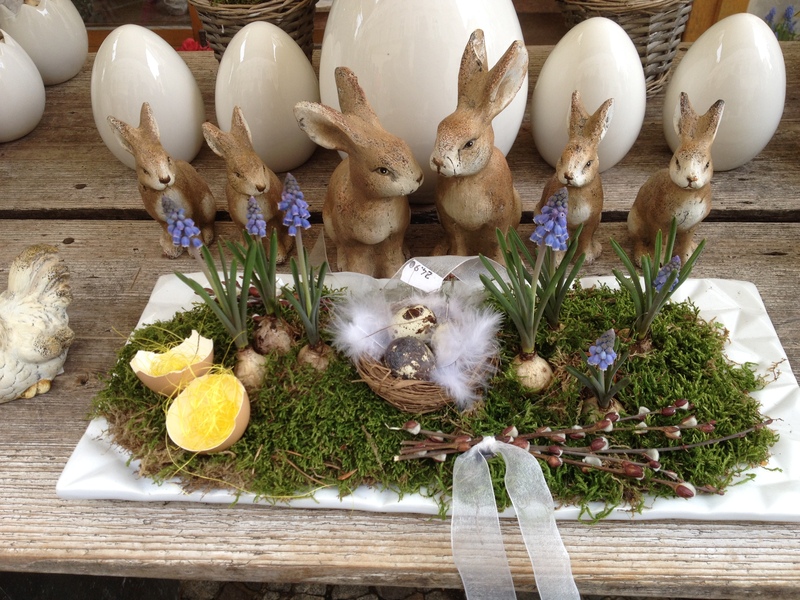 There must have been 50 vendors selling these gorgeous egg treasures. 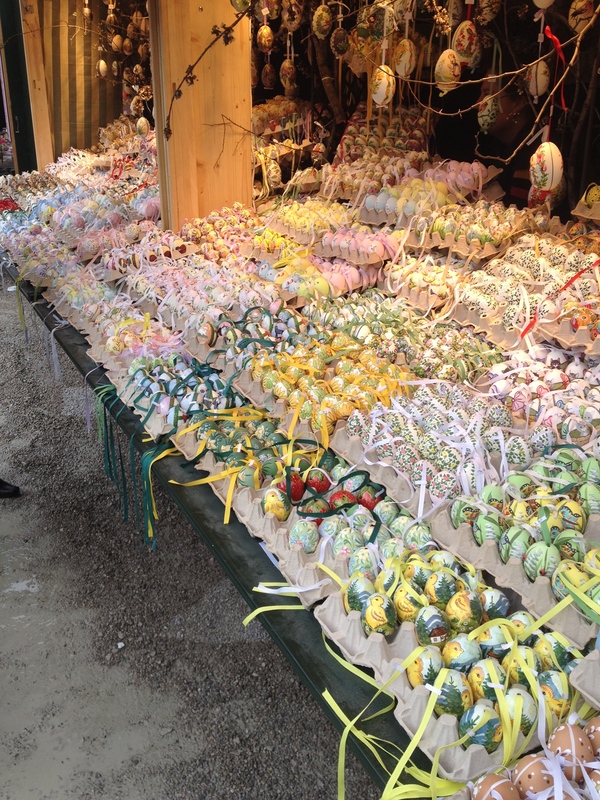 No one could possibly resist them as well as the delightful handmade Easter ornaments, candies, and food. I could have stayed there all day drooling over each and everyone and never entering the Palace. 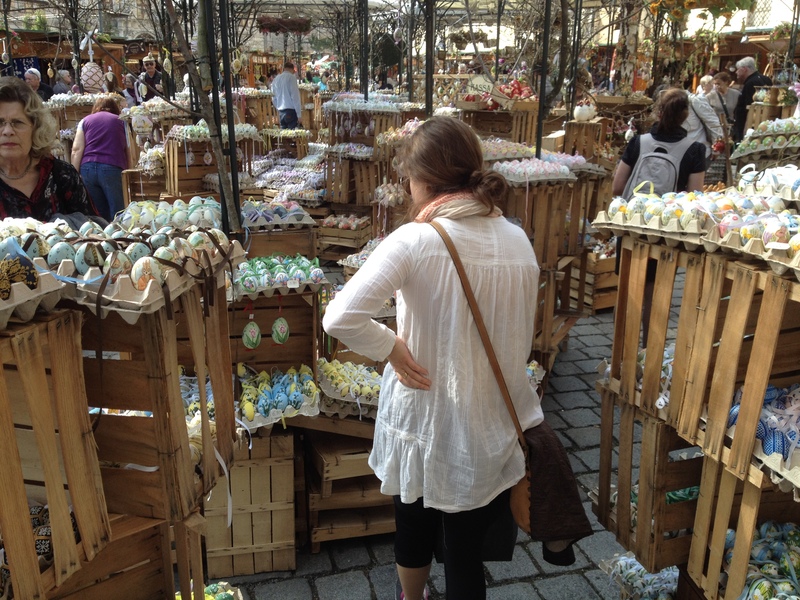 Deciding which to buy was torture, and one does have to consider how they are going to take fragile eggs back to the USA safely tucked in luggage. Well, if I did it before I could do it again! They all made it back with out a single crack. 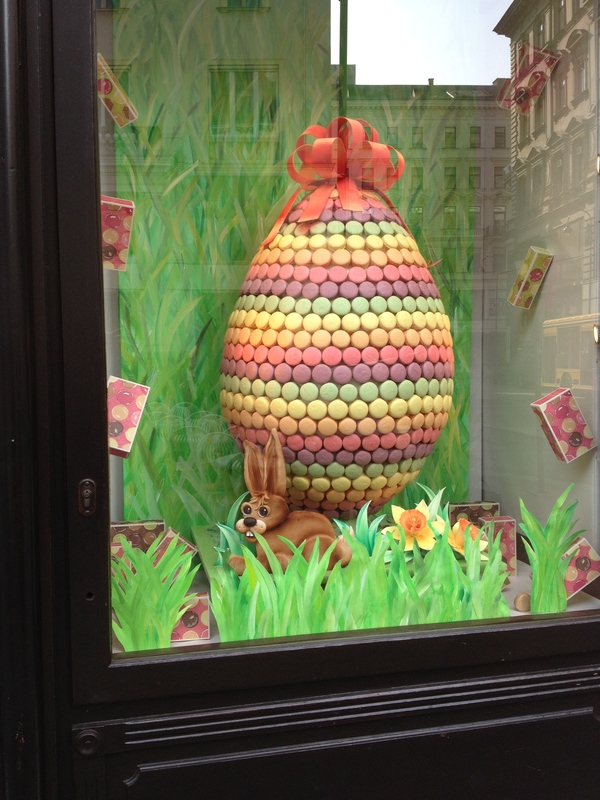 Enjoy these pictures from our egg hunts all over Vienna! Katherine! Which ones do you want?? 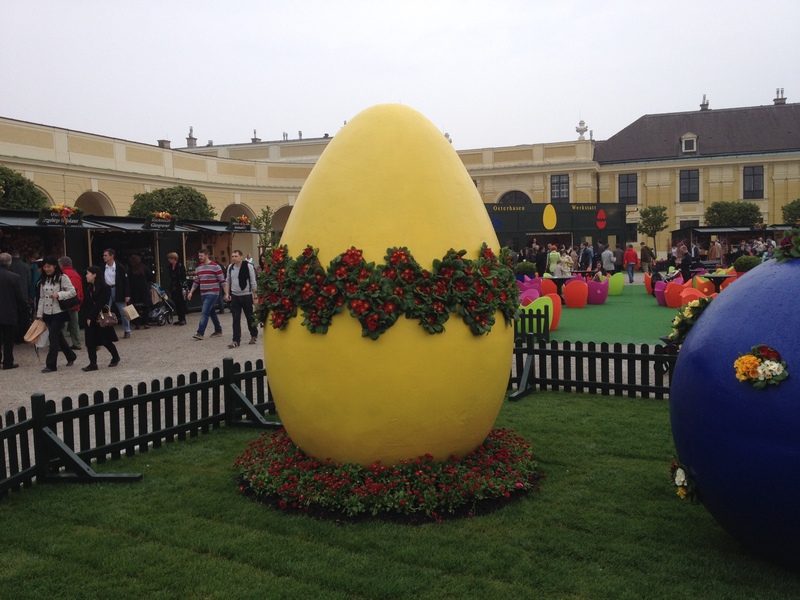 Besides the eggs, touring Schonburnn is a must see if you are in Vienna. This 1,441 roomed Baroque palace is a cultural, architectural and historical treasure and one of Austria’s finest. 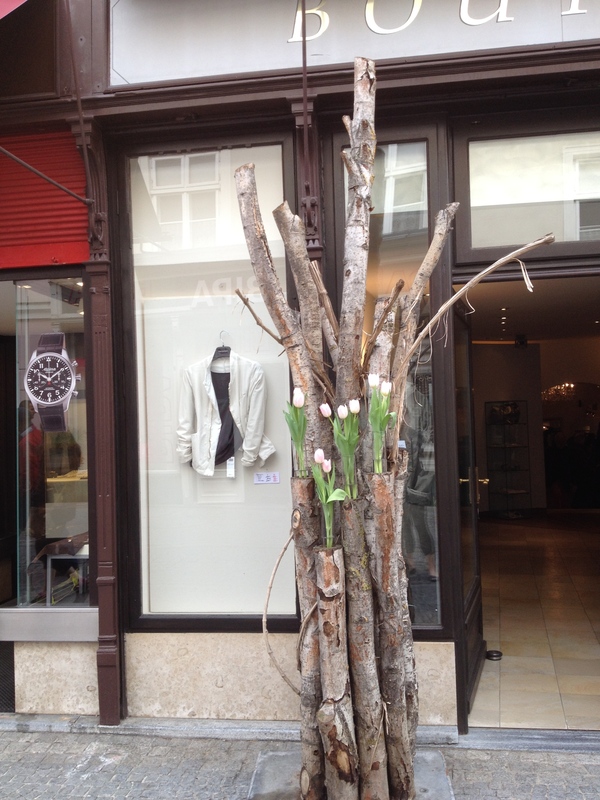 Schonburnn means “beautiful Spring” and the day was exactly that! 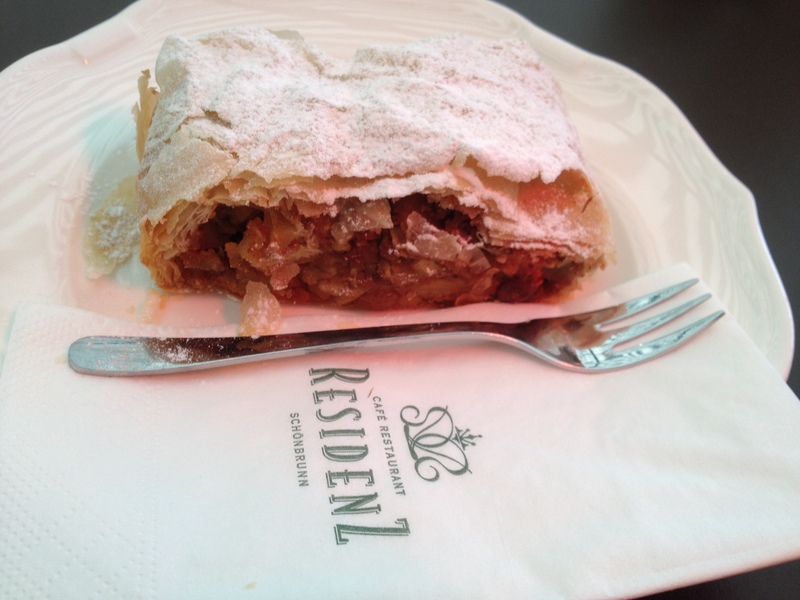 During a rain shower, Katherine and I ducked into the restaurant on the grounds and had a glass of wine and piece of authentic Austrian strudel. Another thing I just adore about big European cities are the linens on the tables. EVERY TIME I go back home I vow to set a beautiful table and use my neatly pressed linens every day. I also swear to eat continentally as well. NEITHER EVER HAPPENS! Adorning our perfectly set table was a brochure indicating we could actually attend a brief class on how our buttery, flakey, apple strudel was made. I can only say it is a very good thing I am incapable of mastering the techniques used by the chef to demonstrate the making of this mouth – watering treat. He literally tossed dough until it was so thin you could read the paper through it. And you got another piece for attending the class! What a great midnight snack we had that night!!! But…. of all the things I loved the most about Vienna the magical windows are still fresh in my mind. This is why I decided to launch Quarry Hill Home at Easter. I am totally an Easter person, Christmas ugh! Don’t get me started. Window shopping became an insatiable temptation for me and I couldn’t pass one with out stopping to take in every detail. 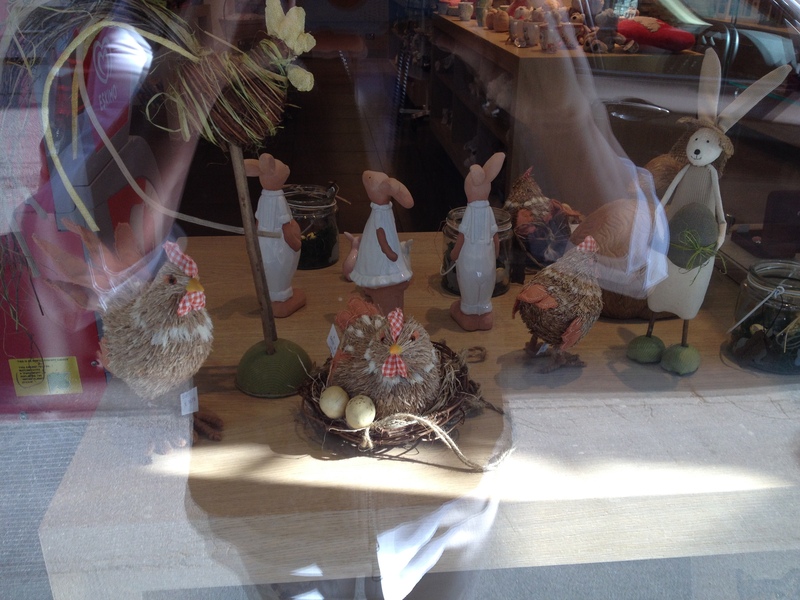 When I was in Geneva in October three years ago the enchanting windows were dressed for fall with woodland scenes of mushrooms, squirrels, hedgehogs, ferns and fairies. I couldn’t control myself until I had collected enough to recreate one these scene in my own home. 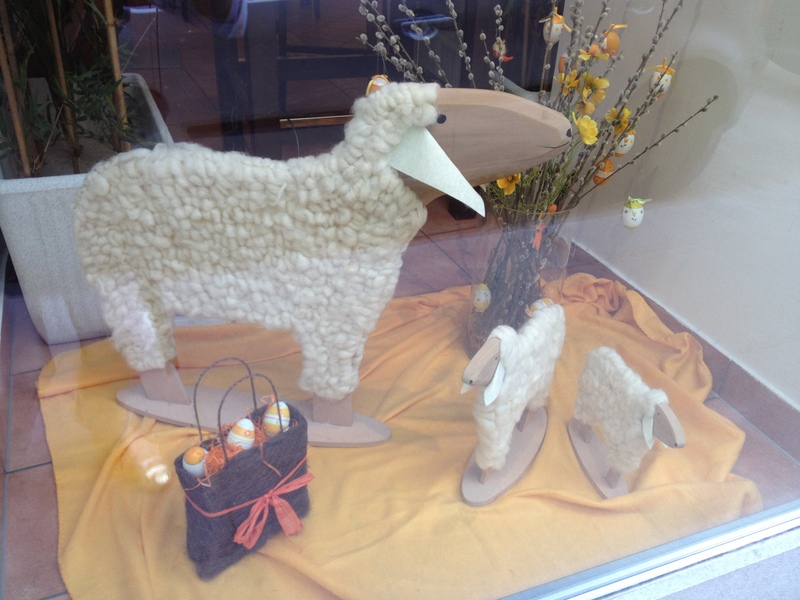 In Vienna it was gorgeous candy, cookies, bunnies, chicks, lambs and flowers that were transformed into the miniature Easter vignettes that dazzled our eyes. These are some of my favorite windows. These photos are the definition of eye candy! Well it is time to start wrapping up this inaugural posting of Quarry Hill Home. 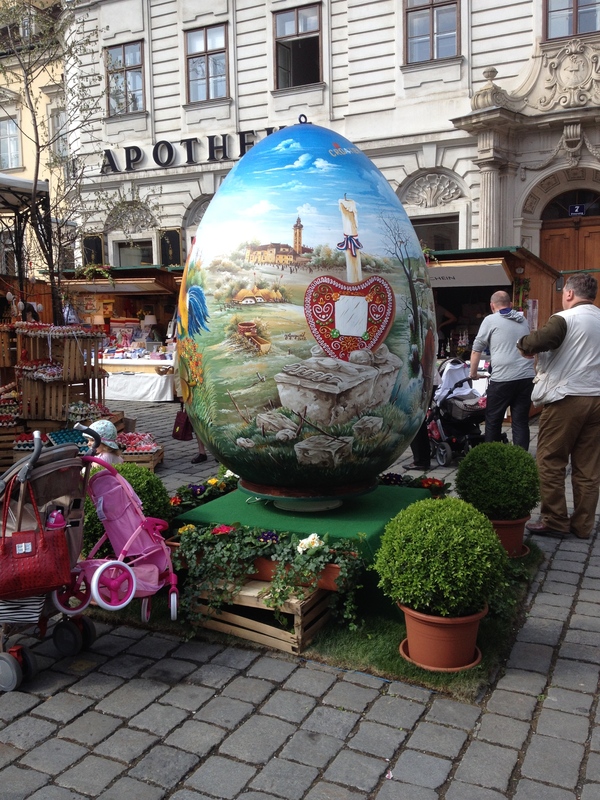 There is so much to love about Vienna and Easter is a wonderful time to go! Katherine and I laughed our way through the rest of Vienna! Here are a few of our last adventures. I ate raw meat on a platter the next day thinking it was thinly sliced cured beef. I was mentally ill the rest of the day! We had homemade spatzle at www.puerstner.com located at Riemergasse 10 – delicious!! Unfortunately we missed the Faberge exhibit at the Kunsthistorisches Museum! I’m still sick about missing that one! Thank you so much for taking the time to read about our trip. I have been working since October to backlog travel adventures to share with you. My goal is to post something new weekly. Not only will I enjoy sharing travel but hope you will enjoy reading about Quarry Hill Home Gardens, Weddings, History and My Favorite Things. Remember I am always happy to carry your bags wherever your travels might take you!!! You have done an incredible job detailing your trip. So well, in fact, that I feel I was there right beside you! I didn’t realize among your many talents that you were such a great writer. 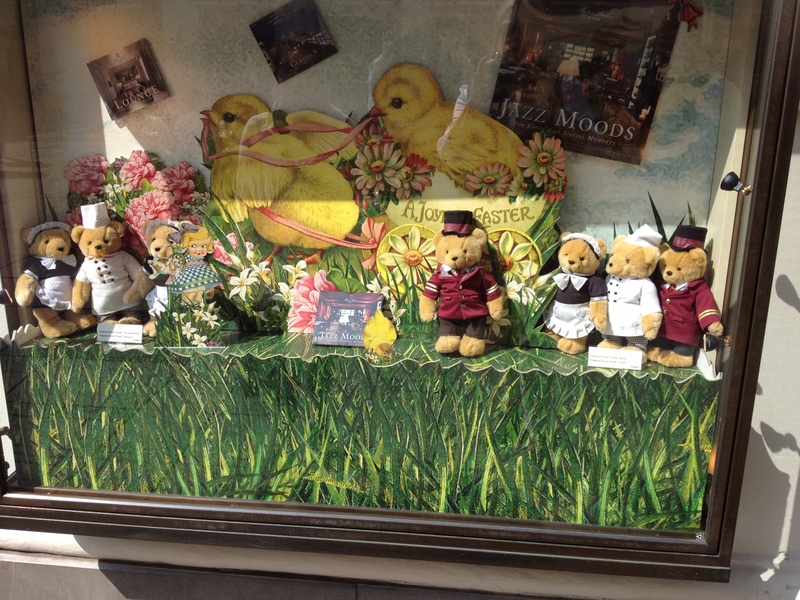 (or that you were adopted) (Much like Jean Howell on her Paris blogs) The Easter eggs in the windows reminded me of those in Brugge (Bruges), Belgium where my daughter and I lucked into them at just the right time in April for their magnificent window displays. The chocolate there is simply the best I have ever had and I have a hard time not comparing theirs to anyone else’s! Love this picture too of the flowers and the balcony too. Thanks for helping my day be brighter! Can’t wait for your next adventure! fantastic! When I lived in Europe, I took this all for granted, sad! Yes, it is beautiful, thank you.